Our Operations Assistant Lisa recently spent some time retracing her childhood in Aberdeenshire – making some brand new memories along the way. Having spent some of my childhood years growing up a few miles south of the city of Aberdeen it was great to visit the area older and wiser, fresh eyes combining with old recollections. My clearest memories involve being on the beach promenade, dipping my toes in the freezing North Sea, spotting jelly fish and running around at the fun fair. The opportunity to visit the city and surrounding areas, 15 years later, was a trip down memory lane in so many ways. Walking through the granite streets as an adult, I pass St. Mark’s Church where nine-year-old me attended Girls Brigade. I can’t help but fondly reminisce as I stare at the grand building, sandwiched between His Majesty’s Theatre and Aberdeen Central Library in the heart of the city. My trip to the city and shire was not just one down memory lane. Myself and my colleague Chris enjoyed a jam-packed three days discovering sights both old and new, driving along the spiralled back roads that connect the remote towns and villages. One town I enjoyed in particular was Portsoy, 50 miles north-west of Aberdeen, tucked away along the Moray Firth coastline. 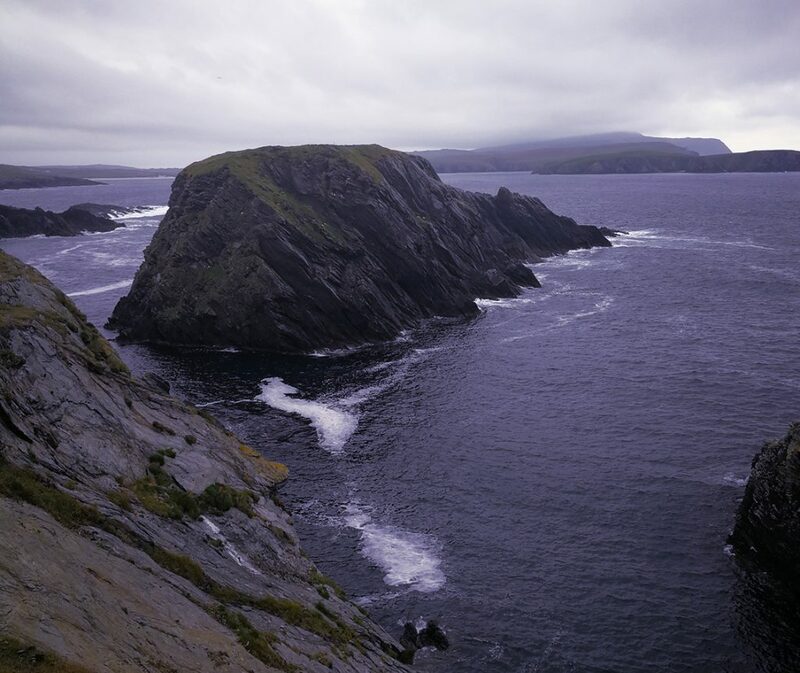 It’s famous for marble, jewellery, fishing and whisky – some combination! We took a slow drive down the empty streets until we reached the town’s waterfront. The eeriness of the quiet streets filled me with a feeling of warm contentment. Although my visit took place in mid-November, I could only imagine how busy the place must be during the “warmer months”. However as a woman who has lived on the edge of the North East coast, I find being next to the sea in winter a heart-warming – if slightly chilling – experience! Our visit to Portsoy was short but very sweet! A brisk stomp on top of the harbour wall was all I could muster before having to sprint for shelter and warmth. The harbour was deserted, with only the noise of squawking sea birds and the waves crashing, which made this experience even more special for me. The sight of the little colourful fishing boats, set against the back drop of the grey village made for a lovely moment. Definitely just one of Aberdeenshire’s charming places to visit. As we drove away from Portsoy, I was already making plans to return to the Moray Coast – perhaps in slightly warmer weather… Having visited the area for the first time in so many years, I am filled with so much inspiration for how to create the perfect holiday to this beautiful and fascinating part of Scotland. McKinlay Kidd are now offering a number of small group guided rail tours. 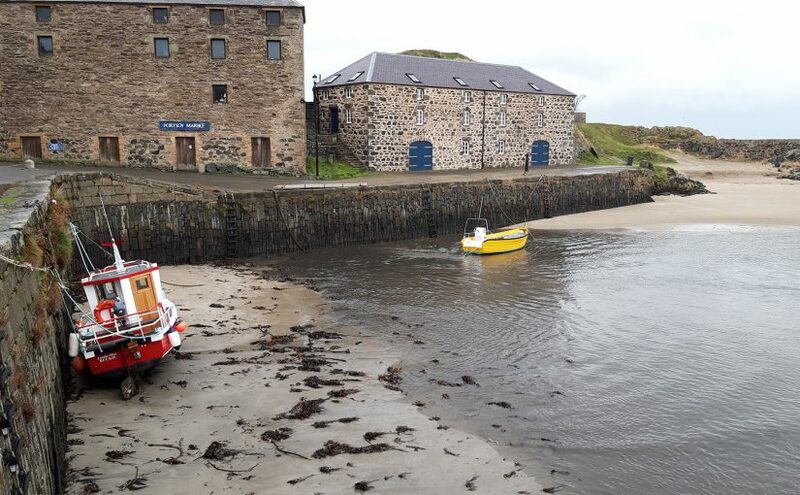 Our ‘Edinburgh & Speyside Whisky Guided Rail Tour’ includes the chance to visit the charming coastal village of Portsoy. Get in touch for more information! On a chilly April morning, I woke up bright and early to explore a small slice of Scotland’s north coast. I must admit that I approached my trip to Easter Ross and Wester Ross with excitement but also some trepidation. Spring was running extremely late in Scotland with the recent snow and heavy rain, and I was hoping I wouldn’t miss any of the dramatic landscape as a result! Our first stop was the village of Cromarty, just 40 minutes from Inverness, but en route we decided to stop at Chanonry Point between Fortrose and Rosemarkie on the Black Isle, as the weather was in our favour. This is widely regarded as one of the best and most reliable places to see bottlenose dolphins and seals playing in the Moray Firth. Sadly I wasn’t lucky enough to spot them this time but the small secluded beach and picturesque lighthouse made for a lovely stopping point. 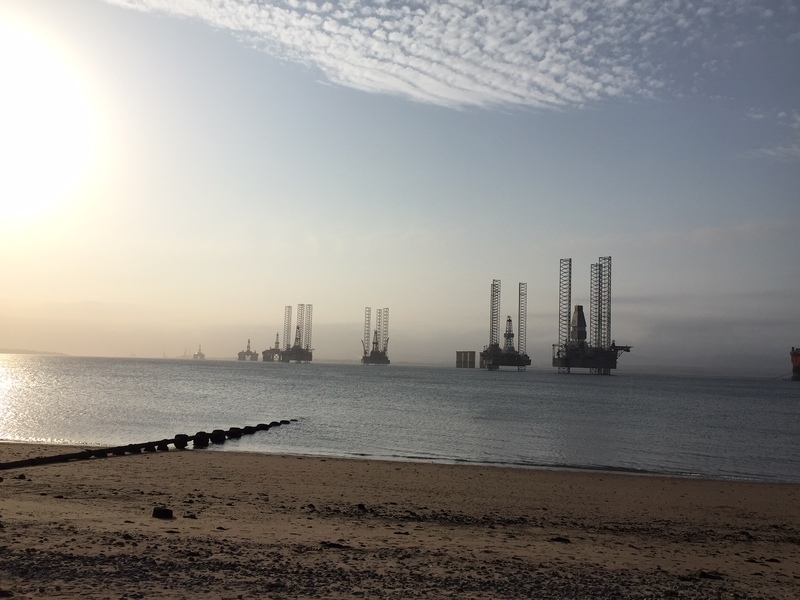 Our arrival in Cromarty was captivating; I hadn’t expected the sight of the ‘oil rig graveyard’ across the Cromarty Firth. Rigs that were active in the 70s – when off shore oil drilling was at its most profitable – now lie dormant, waiting patiently for the industry to take a lucrative turn again. The result is a haunting yet beautiful view. Cromarty too was full of surprises – what I originally saw as a sleepy, friendly village in fact has a vibrant underbelly, with dozens of cultural events each year including a film festival. We moved on to our next stop on the west coast, enjoying the change in scenery from flat yellow meadows to the renowned dramatic and rugged terrain of Scotland’s western highlands. 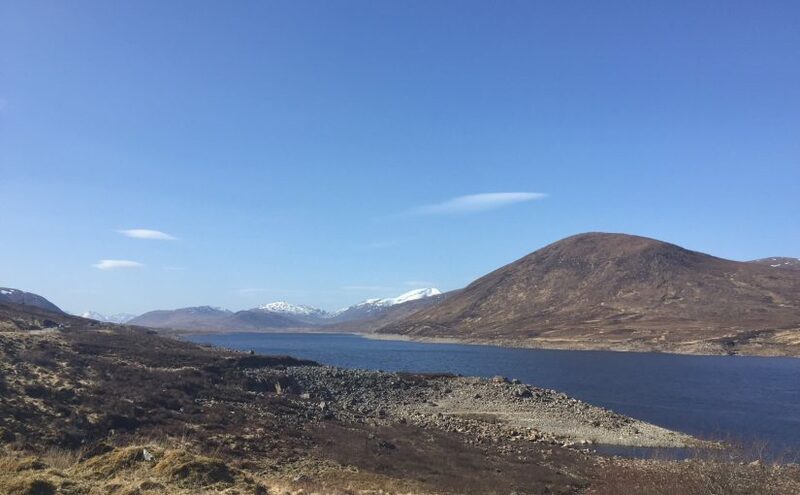 Coinciding with the first real sunshine of Scotland’s spring, we were blessed with clear blue skies and the sight of glittering granite cliffs and snow-capped mountains on the horizon. We headed for Ullapool, a cheerful seaside town with a lot of character and activity despite its remote location. Ullapool’s hardworking residents have transformed it into a hub of culture – the town hosts a number of music and book festivals annually alongside frequent art exhibitions. Seeing the snowy isle of Lewis in the distance from the harbour was a highlight of the day for me, and there is good walking to be had nearby for those wishing to stretch their legs. We had a little spare time before dinner and so visited the Corrieshalloch Gorge on the River-Droma – a truly impressive sight, despite my fear of heights! The last stop on our particular run of the North Coast 500 was Shieldaig and Loch Torridon. A warm bowl of seafood chowder in the Shieldaig’s acclaimed fish restaurant warmed my bones on this chilly afternoon as the sun continued to shine. Our passing Poolewe and the Applecross Peninsula provided a first for me– a sighting of a wild mountain goat! He and his mates considered us carefully before trotting off – a friendly encounter that concluded my trip off very nicely before the drive back to Glasgow. As ever always with touring trips, I was left wanting more – next time I will definitely allow time in Skye or Glen Coe before returning home. I came away from my trip in awe of the beauty of Scotland’s North Coast. We may only have visited one part of this iconic road trip, but I’m very lucky because at McKinlay Kidd, I have the opportunity to help our customers fall in love with it every day! One thing is for sure; I will be back to experience the rest very soon. 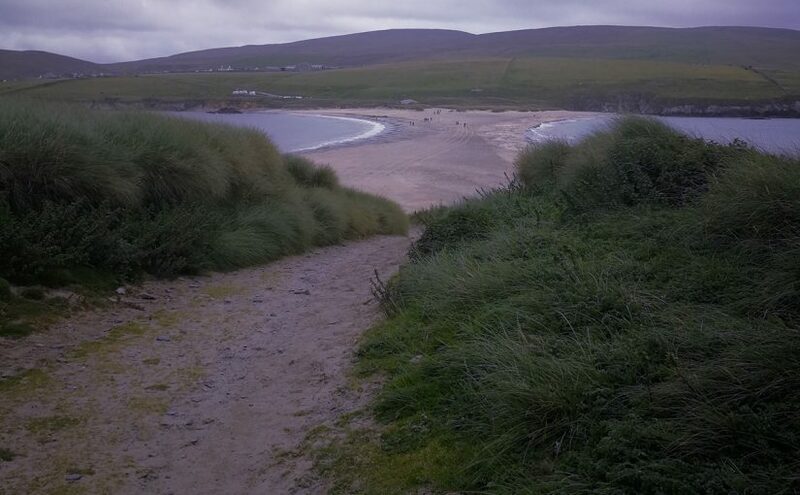 Why not take a road trip like Caoimhe’s and discover Scotland’s North Coast? We have a number of different holiday options, or we can tailor-make your perfect Scottish driving holiday. Being brought up in a small village in the heart of the Northern Irish countryside means I have many fond memories from my childhood that feature local wildlife. Walks at dusk along the country lanes to spot bats with my dad were common, while foxes and grey squirrels were frequent visitors to my grandparents’ garden. For these reasons and more, I was delighted recently to have the chance to spend a weekend getting up close to the wildlife of the Cairngorms National Park – the largest national park in the UK. Spanning over 4500km, there are enough activities to last a lifetime – unfortunately, we had just one weekend to do as much as possible! I felt a sense of excitement building as I found myself surrounded by towering peaks and emerald forestry on our drive into the Highlands. Although I love living in a vibrant city like Glasgow, it is true what they say – you can take the girl out of the countryside, but you can’t take the countryside out of the girl! Our wildlife sightings began early into the trip, as we scaled the mighty Cairn Gorm Mountain on the railway funicular. As I was gazing out of the window with the landscape opening up around me, I noticed a flash of movement from the corner of my eye. A young deer was scampering down the slope! I always find it so thrilling to see deer in the wild – little did I know that this was just the beginning of my day’s sightings. After a quick bite to eat and a wander around the village of Carrbridge, we were ready to explore a small section of the national park on foot. Our choice for the day was Loch an Eilein. One of the quieter lochs in the Cairngorms, Loch an Eilein is unique due to the small island sitting off the shore, featuring the ruins of a crumbling castle. Before our walk even began, I was greeted with an unforgettable sight– a trio of red squirrels in their natural habitat. Each was happily munching on some nuts and completely unbothered by our presence as we furiously snapped some photos – unsurprising really as this encounter took place in the car park! 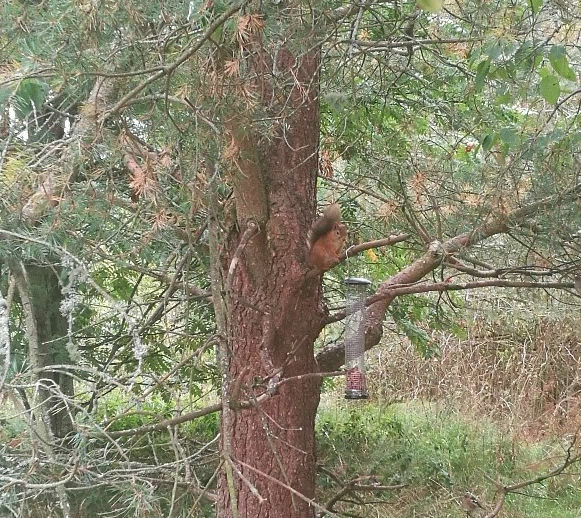 This was the first time I had ever seen a red squirrel, aside from a fleeting glimpse while driving on the Isle of Arran. We didn’t see any more during our walk, but as we strolled through dense forestry on the loch-side in bright sunshine, I was sure they were around somewhere. That evening was undoubtedly the highlight of our trip; we had booked in to spend a few hours in a purpose-built wildlife hide, nestled deep in the Speyside area. Once greeted by our informative and friendly guide, we got comfortable in the cosy room but remained alert, keeping a keen eye out for any signs of life. Luckily, we didn’t need to wait long. A tiny field mouse scrambled up the rocks, nibbling on the various treats that were left out by our guide. But this was only the beginning. 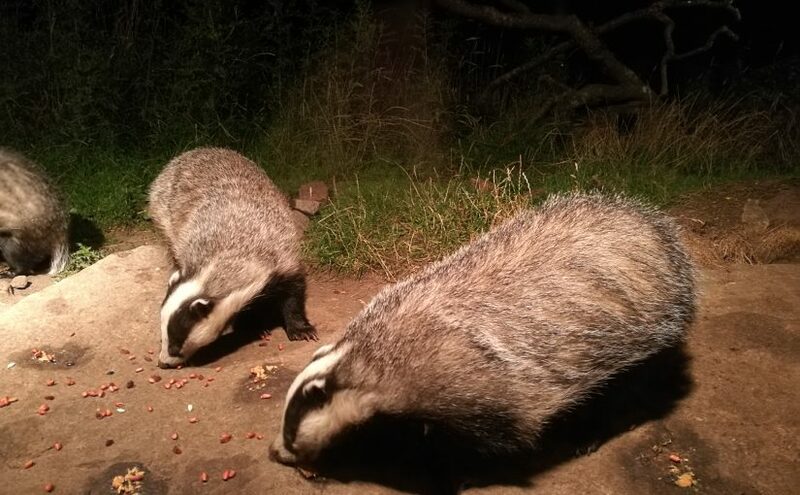 Around twenty minutes into the experience, a young badger cub sniffed his way into the clearing, and began feasting on the seeds directly in front of the windows. Slowly, he was followed by not one, but three other young cubs from the same sett! We sat in silence, watching in awe as they interacted and came into what seemed to be touching distance. The star of the night however, had not yet emerged. We were told in advance that the pine marten had not been spotted in around a week, so we would be lucky if we caught a glimpse of one that night. Fortunately, the odds were in our favour and a young male appeared while the four badgers were still sniffing around! We were spellbound as we watched him climb and jump around a tree, in particular enjoying the peanut butter. At one point there was a strong wind which scattered all of the animals, which we thought had ended our encounter, but we were still delighted with what we had seen. 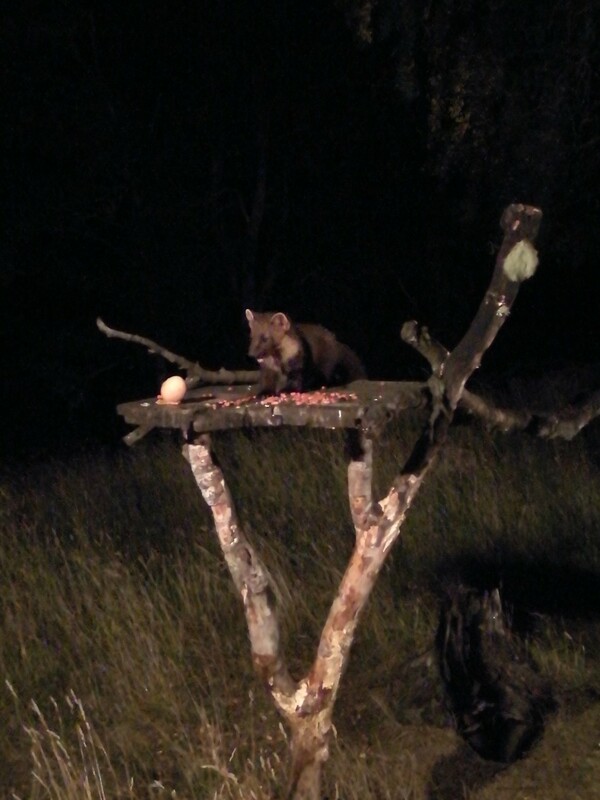 But luck was to strike once more – not only did each badger cub come back, but so did the young pine marten. The wildlife hide seared itself on my memory as an evening I would never forget. One of the only creatures I didn’t spot in the Cairngorms is the incredibly rare wildcat – perhaps next time! Words and images by Emma @ McKinlay Kidd. The Cairngorms National Park is undoubtedly a haven for those who love nature and wildlife. 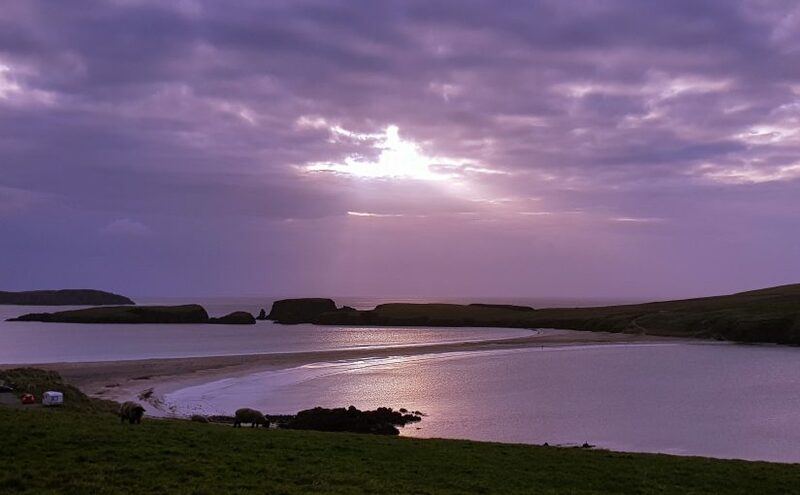 Fortunately, McKinlay Kidd offer a specific wildlife holiday to allow you to have these experiences for yourself – or you can tailor-make any of our other holidays to include some wildlife watching activities. I take a glance in the rear view mirror, and can see Glasgow slowly disappearing as we drive north. The weather may have been dreich (dreary) when we left the city, but I can already see the clouds lifting as we inch closer to our destination. I turn the music up, and smile – I am on my way to the Isle of Skye for the very first time. The road bends along the shore of the magnificent Loch Lomond and through the spectacular valley of Glencoe. I like this drive – it feels like the narrower the road gets, the more spectacular the views become; I feel rewarded for driving there. What I don’t know yet is that this feeling of wonder won’t leave me for the next three days. 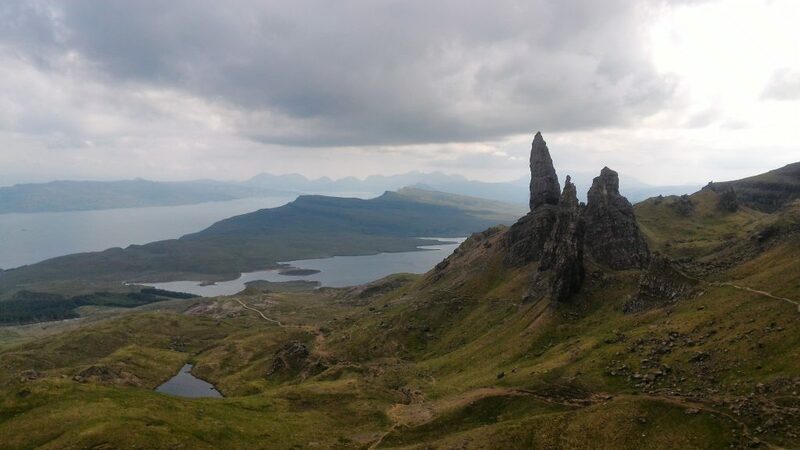 One of our first destinations is the Old Man of Storr. I had seen pictures of this iconic location in guide books and all over the Internet for years. I was worried of being disappointed with the reality of the landscape, but I couldn’t have been more wrong. The beauty and unique atmosphere of the place make it a must-see attraction and gives you infinite photo opportunities. Back on the road again, I cannot remember the last time I was so astounded by a drive. The scenery surprises me at every corner, ever-changing from flat and grassy land to rocky jagged mountains, secluded inlets to expansive sea views, bustling towns to tranquil glens. On each narrow winding road, we are constantly on the lookout for parking places to stop and take pictures. I soon discover that photos can’t quite do the beauty justice, so, I decide to stop looking through the lens of my camera and focus on the moment – once again, I cannot stop smiling. A few more “wows” and we hop back into the car – until we next cannot resist stopping again, of course. In the evening on our way back from the famous Fairy Pools, the midges have come out but the sky is still too bright to call it a day, so we walk to a local pub. When we open the door, we are welcomed by delightful live music – a local Cèilidh band is playing! The crowd is so energetic that we can barely see the musicians- tables have been pushed to the side and everyone is dancing. The sun rises so early in this season that the sky is already bright as we wake up the next day. 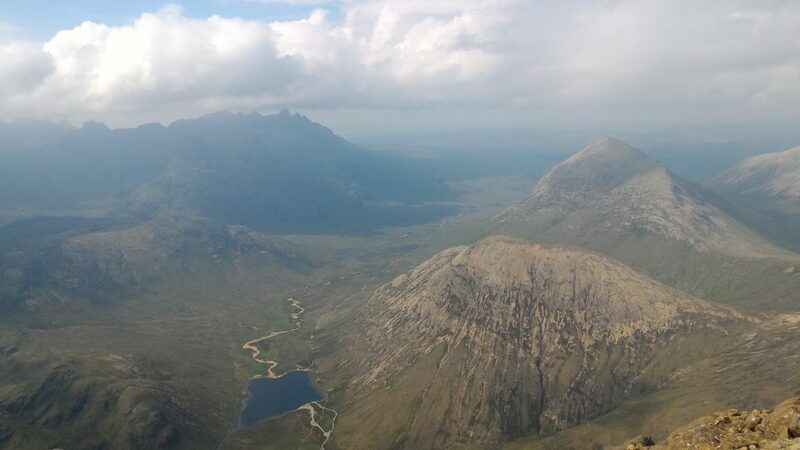 Today, we decide to hike up Blà Bheinn, one of Skye’s twelve Munros. Here again, the landscape constantly changes as we hike up. Slowly but surely, the dense vegetation gives way to a rockier scramble, and the view reveals itself as we reach higher ground. It is nearly lunch time when we reach the summit. Our legs feel heavy after the strenuous ascent, but somehow we cannot stop walking – the view in every direction is spectacular. We want to see as much as we can, so we continue walking along a narrow ridge to reach a second summit. Eventually we decide to drop our bags, choosing some rocks to be our lofty thrones, victorious after a fierce hike. We sit in silence, contemplating the horizon. The Cuillin Mountains are visible below the clouds and in one direction we can see the Isle of Rum. This is a hike that I will not forget in a hurry. Sadly, the time eventually comes for us to say goodbye to this remarkable island. As we drive away, I look in the rear view mirror one more time. However, I know that I am not really leaving the Isle of Skye today, because every day at McKinlay Kidd we travel back there – virtually – as our customers travel to ensure that your experience on this island is incredible, and that like me, a smile does not leave your face for the duration of your stay. Words and images from Helene @ McKinlay Kidd. 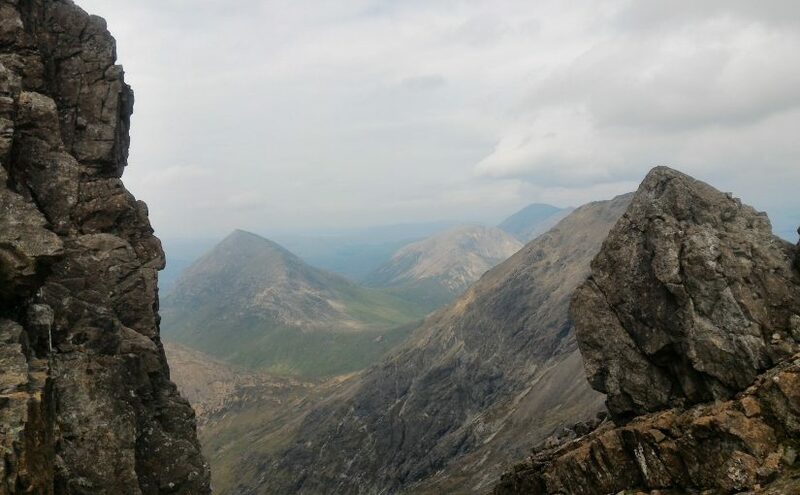 If you would like to experience the spectacular Isle of Skye – perhaps with a little less walking! – then our West Highland Line to Skye, West Coast Whisky Islands or Skye & Hebrides Fly-Drive holidays may fit the bill. Alternatively, we would be delighted to tailor-make your unforgettable trip. As someone who has lived in Glasgow for less than a year, there are so many activities and places that I am still exploring every day. 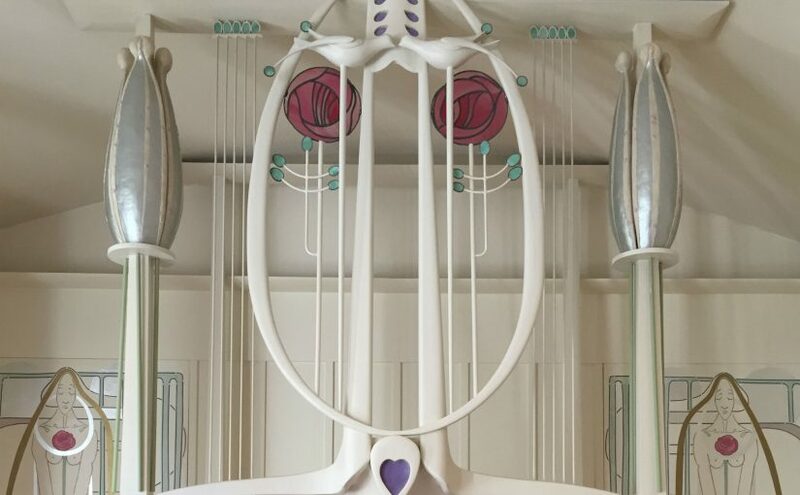 If there is one thing I have noticed time and time again, it is the influence of Charles Rennie Mackintosh, one of Glasgow’s – and indeed Scotland’s – most daring, innovative and influential creative figures. Recently there has been another tragic fire in Mackintosh’s School of Art, meaning this particular site will not be accessible for some time. However, as 2018 marks the 150th anniversary of his birth, there are spaces all over Glasgow dedicated to Mackintosh and his life’s work. I decided that this – combined with an opportune visit from my art-loving parents – created the perfect occasion to begin my journey discovering the legacy of this fascinating man. This temporary exhibition offered the perfect first step in my Mackintosh education. 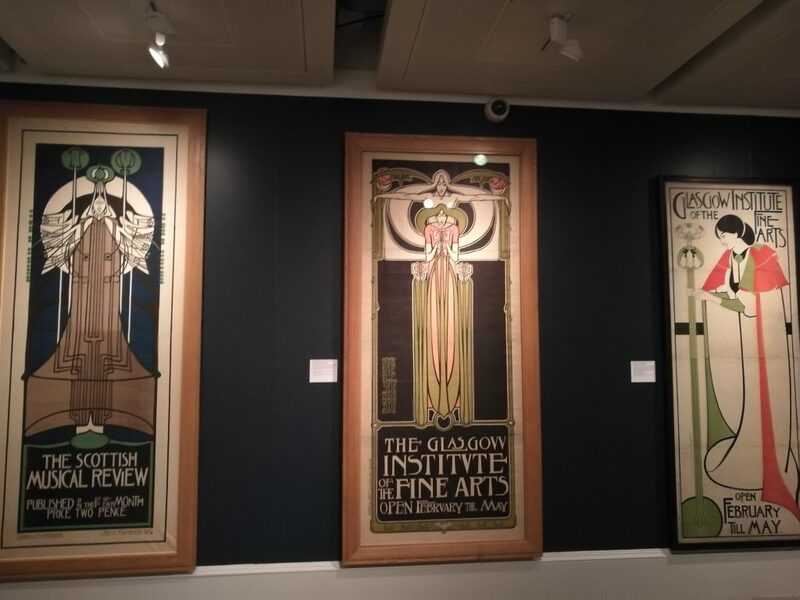 I found myself in the spectacular surroundings of Kelvingrove Museum, marvelling at over 250 items – some never before seen in public–from both Mackintosh and other influential designers of the time. The exhibition is surprisingly interactive – one of my personal highlights is the 7-minute video that explores Glasgow with cameras and drones, covering both the exterior and interior design of many of Mackintosh’s most famous works and those he inspired. Included in this footage was – to my delight – the famous Hatrack building – also known as McKinlay Kidd’s new office! A long beloved Glasgow institution, 217 Sauchiehall Street is the site of Mackintosh’s original tearooms, unique in the fact that Mackintosh not only designed the interior, but the exterior of the building. The refurbished tearooms have only been open for a few weeks and are not entirely complete, but the experience of dining there is already superb. I took my parents for a mid-afternoon snack and we were impressed with the attention to detail. 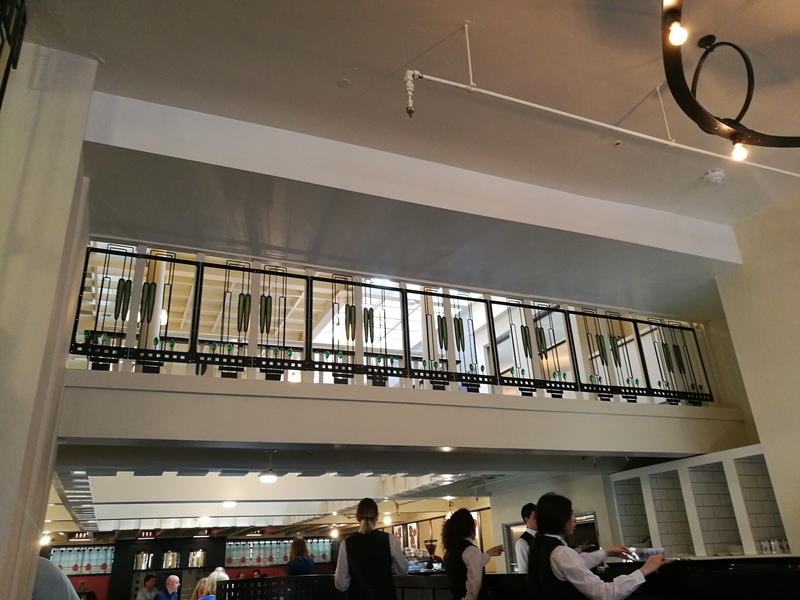 The devotion to Mackintosh’s original work is clear, from the style of the chairs to the light fixtures, the stained glass balcony to the blue Willow china. There is also a fabulous gift shop that enables you to bring some of the tearoom’s design into your own home. Not to mention the delicious scones – an absolute must after a long day shopping or sightseeing in Glasgow city centre! 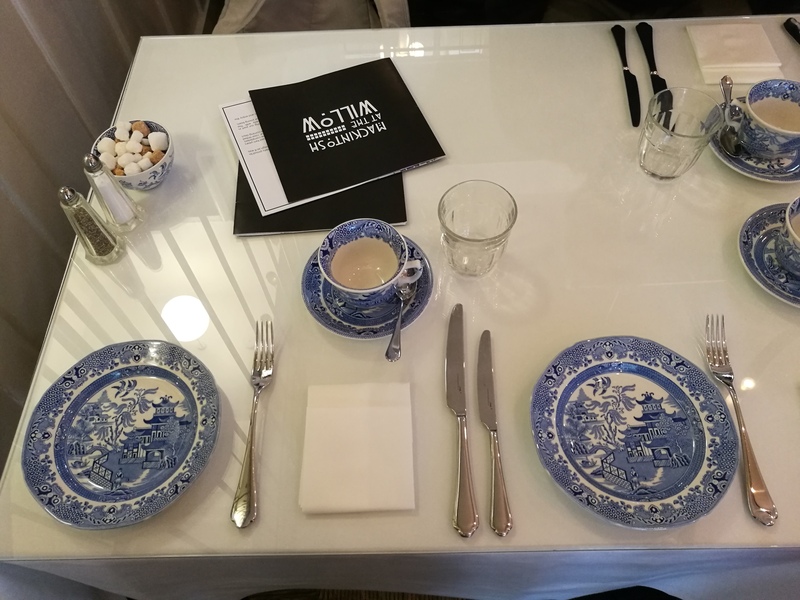 It is actually due to McKinlay Kidd that I was fortunate enough to attend House for An Art Lover after hours, as we recently celebrated our 15th birthday as a company in the lavish dining and music rooms. 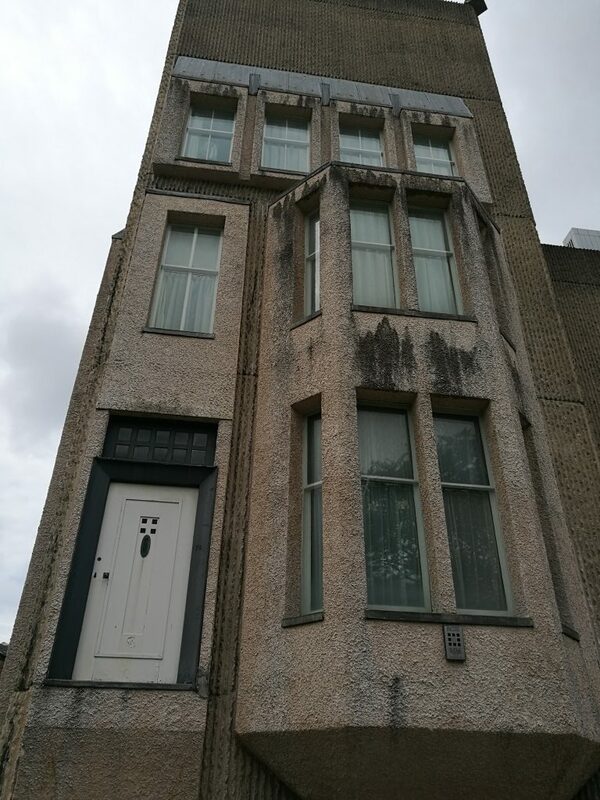 Although not constructed until 1989, the plans for House for An Art Lover were created by Mackintosh in 1901 and the building really is a testament to his enigmatic artistic vision. The décor and the surroundings of Bellahouston Park foster a special ambiance. One of the most unique art installations in the city, Mackintosh House is a full-scale replica of the house where Charles and his wife Margaret lived, adjacent to the Hunterian Museum in Glasgow’s West End. By the time I visited the house, I was aware of the signs of a tell-tale Mackintosh masterpiece, meaning I could appreciate the intricate detail of each room. His use of light, for example– his designs always managed to make a room as bright and light as possible. From the coat rack to the fireplaces and writing bureaus, the Mackintosh belief that every element of the interior had to work in perfect harmony is clear. No matter where I went, one fundamental fact remained – the sheer detail involved in Mackintosh’s work is extraordinary. Down to even the letterheads for the Glasgow School of Art, Mackintosh would clearly eat, sleep and breathe his work, unable to rest as he was designing another masterpiece. Interestingly, something that really spoke to me as I explored the city was the profound impact that Mackintosh’s wife, Margaret, had not only on the Glasgow style, but on the design so synonymous with the Mackintosh name. She designed the menus for Miss Cranston’s tearooms, the decorative panels for the music room in House for An Art Lover and indeed was responsible for much of the interior of Mackintosh House. While the focus this year is on her husband, it is clear that Margaret is worthy of equal accolade. One thing is certain; I am now walking the streets of Glasgow with a greater appreciation for the man who left an indelible mark on the city with his creative vision. 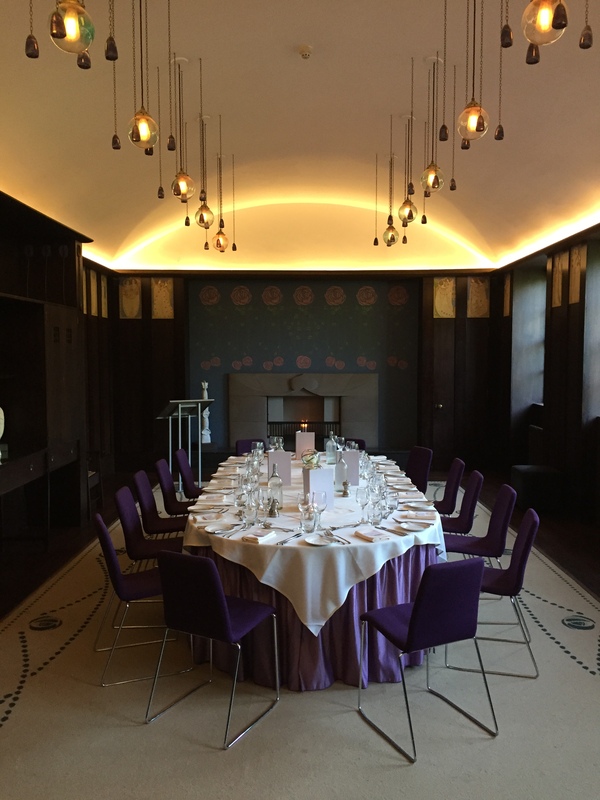 If you would like to discover more about Mackintosh’s legacy in Scotland, we would be delighted to tailor-make your perfect holiday. Otters are supposedly secretive creatures but not this one! Last weekend we were sitting on our rug on the rocks enjoying peace and quiet and warm sunshine on a deserted Kintyre beach. Out of the corner of my eye, I saw movement, a glimpse of brown. Ah, that would be a dog, no doubt closely followed by its two-legged owner. Wrong, I realised, that’s actually a rather large dog otter padding its way across the sand! I resisted the temptation to let out a squeal from my wide-open mouth. Instead I turned to Robert beside me, nudging him and gesturing to draw his attention. We both watched in awe as the rather ungainly creature wobbled his way to the water’s edge, then slipped sveltely into the brine, transformed into a darting swimmer. Arching his back, he dipped under, his long tail flicking behind. We rummaged for the i-phone and binoculars as silently as we could. He emerged amid the lapping seaweed, hungrily devouring a small, silver fish. Then he dipped back under, reappearing with a large crab. He was close enough for us to observe with naked eyes, hearing the crunch-crunch as his sharp teeth cracked their way into the shell. The scene repeated itself for several more minutes as we did our best to take a few snaps and short videos on the phone, albeit needing to zoom. While our new furry friend was swimming around, we stealthily moved a little nearer. At this point we saw criss-crossing footprints all over the wet sand behind us – the creature had clearly been wandering around unbeknown to us for quite some time earlier. As good fortune would have it, the otter next popped up further to our left and hauled itself out into a barnacled rock, its shiny brown coat perfectly contrasting with the grey-white stone. Robert started filming. Earlier the same day I had been strolling on a neighbouring beach as a pod of a dozen or so dolphins splashed their way past – just the third time in fifteen years I’d watched such a sight from these strands. And our wildlife adventure had yet another twist to come. After the excitement of our close encounter with the otter, we settled down to enjoy the more regular birdlife: diving gannets, screeching oystercatchers, swooping gulls, darting sand martins, elegant terns and the occasional pair of adult ducks followed by a stream of cute ducklings. A grebe, with its distinctive head-dress, swam quietly past. The tide had recently but imperceptibly turned, the sea still flat calm, a shimmering steel-blue colour. We spotted a black shape purposefully heading out to sea towards the Isle of Sanda. Our first instinct was to think it was the otter, but the swimming style was all wrong. The binoculars revealed a clear triangular fin scything through the water. Cue Jaws theme music. However, in the West of Scotland, the only sharks are of the more benign basking kind. They prey on plankton, hoovering it up through a gaping jaw. 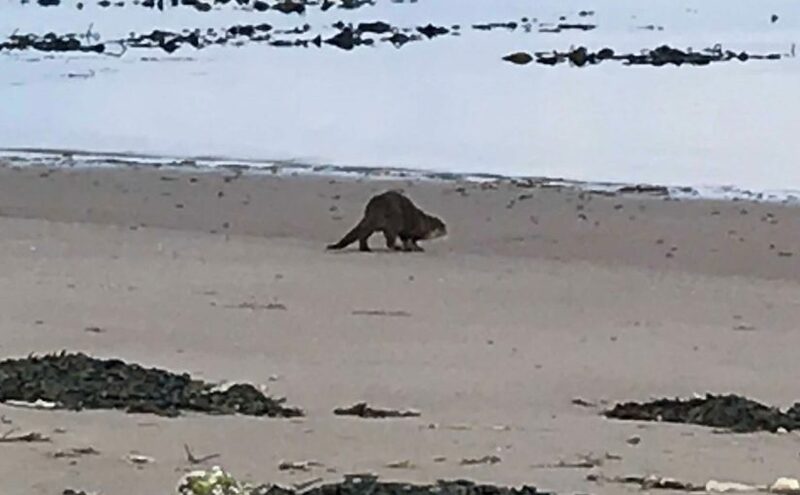 We’ve seen them before off the Isle of Mull on one of McKinlay Kidd’s wildlife trips, but this was a first (and shortly after, a second) for us in Kintyre. Local knowledge suggests these huge mammals used to be much more numerous but have been very scarce in recent years. 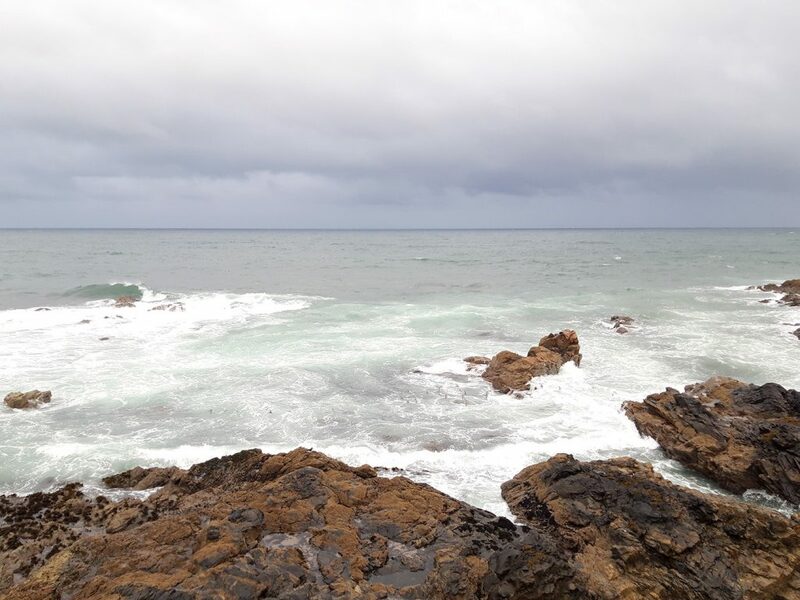 The sea conditions aided our chances of spotting them and perhaps the recent lengthy spell of warm and settled weather had led to an abundance of food, attracting them back to the area. In any case, it was the perfect end to a very wild day! 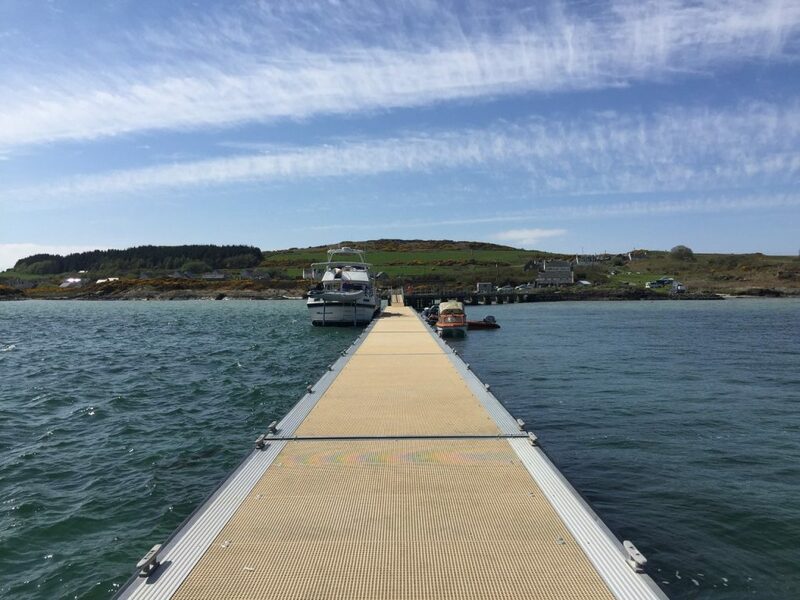 I recently set off from the bustling city centre of Glasgow on a gloriously sunny Saturday afternoon to enjoy a relaxing bank holiday weekend and experience island life on the Isle of Gigha. Even the drive to the ferry port was spectacular. By the time I hit Loch Lomond, the weather had turned in true Scottish fashion. The majestic scenery was blanketed in a layer of stunning low cloud, turning the journey into a beautiful and dramatic drive! I travelled on through picturesque towns, such as Tarbet and Arrochar, before reaching my personal favourite, Inverary. With a ferry to catch I tore myself away from the stunning spot, making plans to visit properly on the return trip. As I made my way towards Tayinloan ferry port the sun broke back through the clouds. I pulled in with enough time to enjoy a quick bite to eat and a refreshing beverage from the family-run cafe close to the dock. I wandered down the pier and was greeted by a white sandy beach with crystal clear water. The view had me almost believing that I was on an exotic island in the Caribbean! The ferry journey takes around 20 minutes and once disembarking, my hotel for the next two nights was a short two-minute drive from the port. 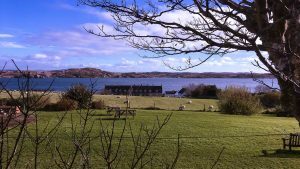 After a simple check in, I went upstairs to my large double room to the front of the hotel, which had breath-taking views over the Sound of Gigha. 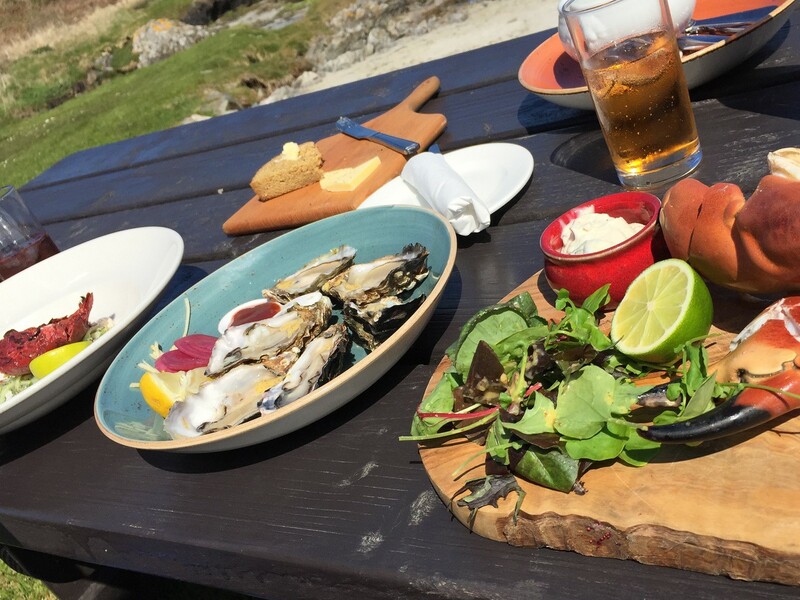 That evening I enjoyed a delicious dinner including some locally caught seafood, and made my way to the bar for a night cap and to get to know some of the Gigha locals. However, tonight called for an early night as I prepared to explore the next day. I awoke to another glorious day and tucked into a hearty full Scottish breakfast. I then drove to the South Pier at the southernmost point of the island, where there are some beautiful secluded beaches and more stunning views of mainland Scotland across the water. Along the way I stopped off at the spectacular Achamore Gardens. These 54-acre gardens host many notable and unusual plants and trees from around the world. 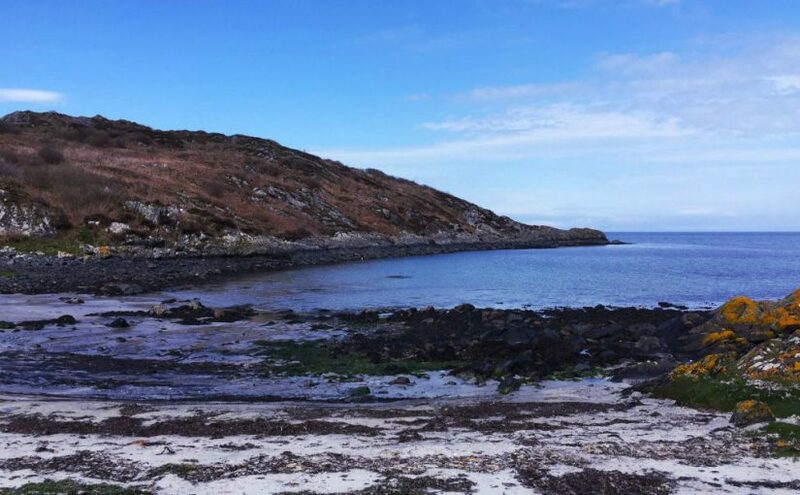 Then I continued to the north of the island, and the small bay with its twin apple-core beaches and views out west to the isles of Jura and Islay. By the late afternoon I had worked up an appetite so made my way to my lunch reservation at the island’s local eatery, located near the ferry port. 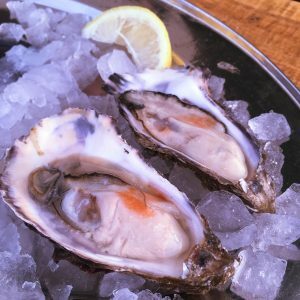 All I can say is this was a taste sensation and I had some of the best seafood I have ever eaten anywhere; not to mention the views from the table! The staff were also outstanding, all locals who were never too busy to discuss the island and its rich history. After my lunch I dropped the car off and went exploring on foot, discovering the local church and golf course. 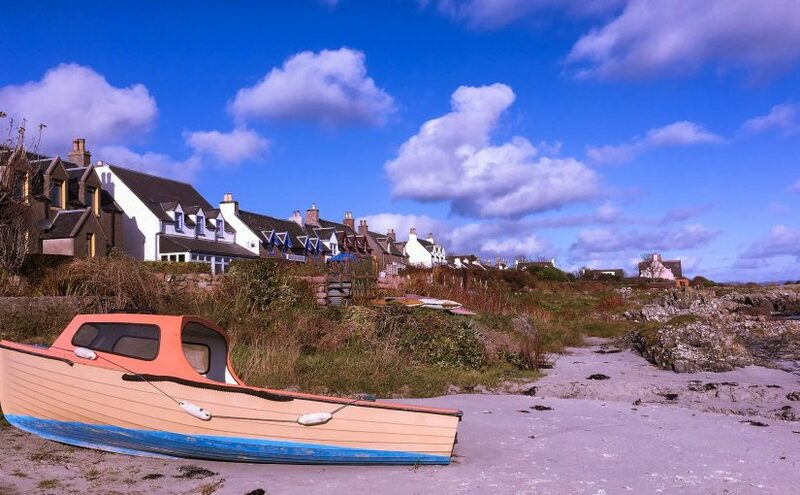 Gigha is a quaint island – the locals are very welcoming and I am very much looking forward to returning. The next day I was up early to set sail for the Kintyre penninsulaon the first ferry of the day, and quickly found myself heading back north towards Inverary. Here I stopped for a coffee and fresh croissant in one of the many cafes. The town even in the early hours is alive and bustling with visitors! I found myself at the castle and spent some time there taking in the scenery. My next stop was Loch Fyne where I treated myself to some oysters and chowder at the loch front. I even had time to drop into the local Loch Fyne brewery to buy some craft beer samples to enjoy that evening after getting home. The weather stayed perfect the whole way back to Glasgow as I ended my trip. The island was beautiful, peaceful and the ideal getaway from the city living. 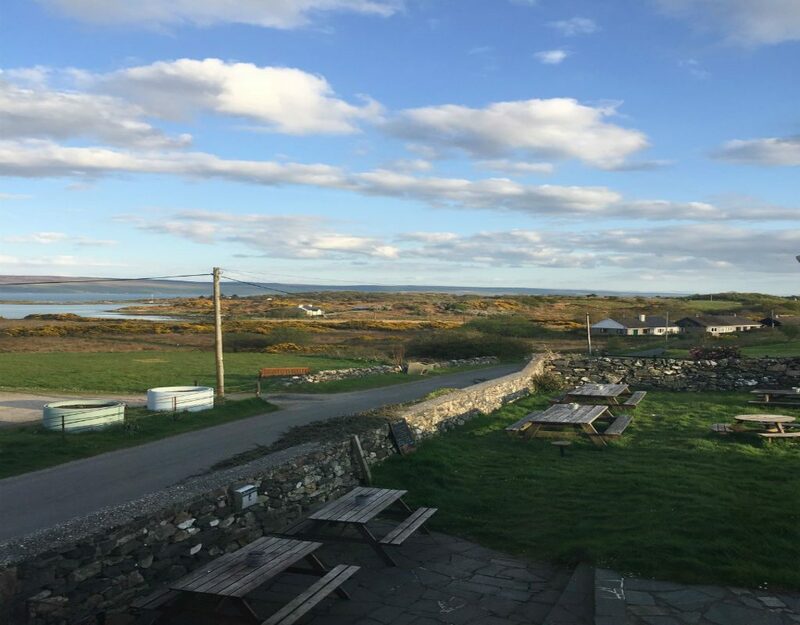 Gigha is definitely a perfect place to relax and unwind! My first trip through the western Highlands was a wonderful discovery of old and new. Coming from Ireland originally, I have strong beliefs that the Irish countryside will always be the most beautiful I’ll encounter but I was happy to find stiff competition on these magical islands of Mull and Iona. I knew things were off to a good start when after collecting my ferry ticket at the harbour in cheerful Oban, I enjoyed some enormous ice-cold oysters opened in front of me at a fresh seafood stall right next to the ticket office. I held on to that marvellous flavour of the sea as we set off, setting the tone for my trip brilliantly. As the weather was crisp and dry, I wanted to take advantage of it so I wrapped up warmly and took in the view from the open air deck, enjoying the picturesque Eilean Musdile lighthouse bathed in the late afternoon light as we passed. On arrival on Mull we drove to Tobermory through the setting sun, catching the brightly painted harbour front just before darkness. Mull is known for its wildlife as much as its beauty so the following day we went out with some local experts to see for ourselves. The day’s arc was perfect; birds including white tailed eagles in the morning, otters at lunchtime and red deer late afternoon. 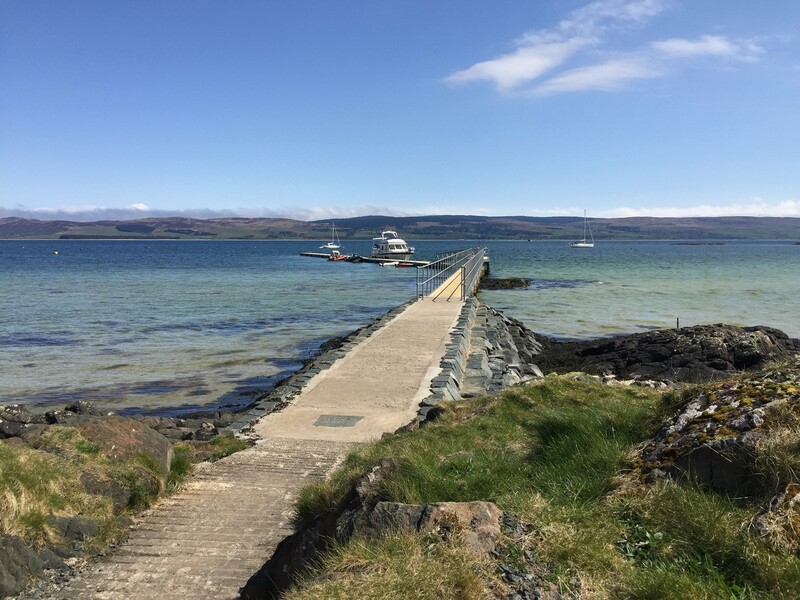 I was struck by Mull’s changing scenery as we went – volcanic pillow lava causing rocky terrain, soft rolling fields and woodland covered in soft green lichen – all confirming the pure air on the island. Another fun sight was the ubiquitous sheep nibbling seaweed at the water’s edge. I was kept going myself by a lovely spread provided by our guide: hot soup, sandwiches, coffee and cake. 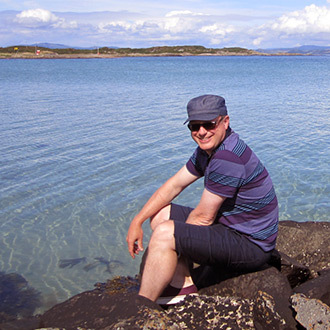 I enjoyed a rounded education of the island from nature to history, learning of islanders of times gone by suffering the effects of the Highland clearances and using seaweed to fertilise meagre potato crops by the rocky coast, and returned to Tobermory with insider knowledge of my surroundings. The Isle of Iona was next on the itinerary, beginning with an early rise and drive to Fionnphort on the opposite side of the Island. We parked the car and could see Iona waiting for us as we boarded the ferry as foot passengers. 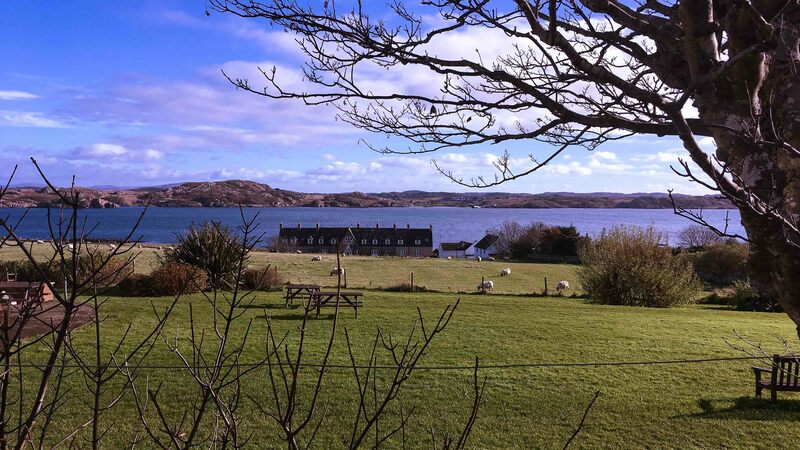 I can’t quite put my finger on what it was as we alighted but something about Iona is instantly warming. I was lucky to enjoy a tour of a hotel garden by the resident gardener and was delighted to see seaweed feeding the soil as a nod to traditions of the past. Home grown produce is common on these islands to ensure freshness rather than rely on deliveries and I loved seeing beds full of fruit, vegetable and edible flower seedlings waiting for next season’s guests to enjoy. 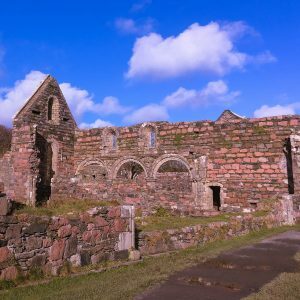 Though I had planned on seeing it, the Abbey came as almost a surprise on this tiny island, such was its magnitude thrust into sharp relief by its diminutive surroundings. 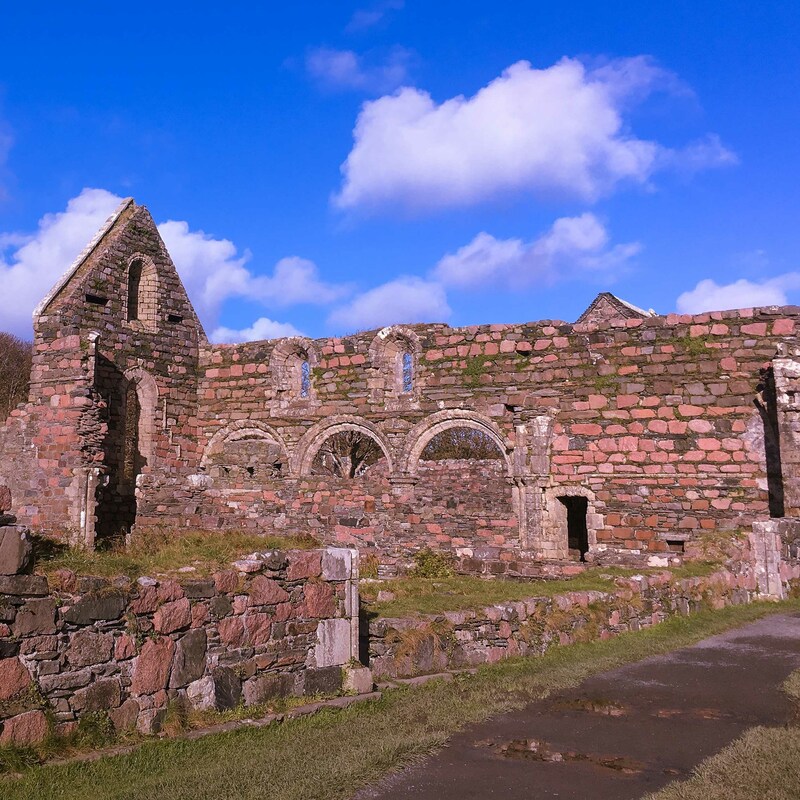 The remains of the nunnery was an interesting wander also, the nuns on Iona having enjoyed a thriving social life on Iona as active members of the community. It was easy to see why Iona had and has a deeply spiritual resonance for some; it feels somehow brighter than the rest of the world when you are there. But all good things must come to an end and the drive back through Mull brought new discoveries as we went. I returned to Glasgow with warm memories of two magical islands.